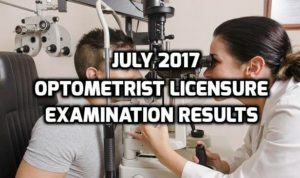 From the latest news information of the July 2017 Optometrist Licensure Exam, the Professional Regulation Commission (PRC) already released the list of the successful examinees after one week of the final examination day. The Board of Optometry administered the scheduled examinations last month and according to the commission, 138 examinees passed the board out of 169 applicants. The board members who are part of the examinations include Chairman Dr. Teresita R. Yambot, Dr. Bernardita A. Garcia, Dr. Mary Rose S. Paredes, Dr. Vivian S. Sarabia (inhibited) and Dr. Maria Elizabeth B. Valconcha (inhibited), as detailed by the PRC. The commission likewise announced through its official website that the issuance of the Professional ID Cards as well as Registration Certificate will be on August 4-7, 2017. All the passers need to visit prc.gov.ph to complete the process online as instructed by the PRC.